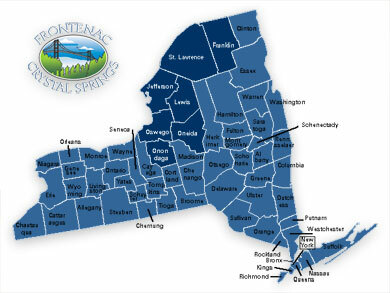 Frontenac Crystal Springs provides local delivery to homes and offices in the counties highlighted on the map. To start delivery service, please call 315-686-4142 or toll free 1(800)722-0236. Current customers can download their delivery routes (Adobe PDF) here. 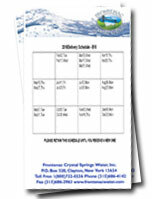 If you are looking for wholesale opportunities or private label water bottles and you are located outside of our delivery area, we still may be able to provide you service. Please email info@frontenacwater.com to discuss these opportunities.